Tickets WILL be available at the gate for $80. All cabins are sold out. 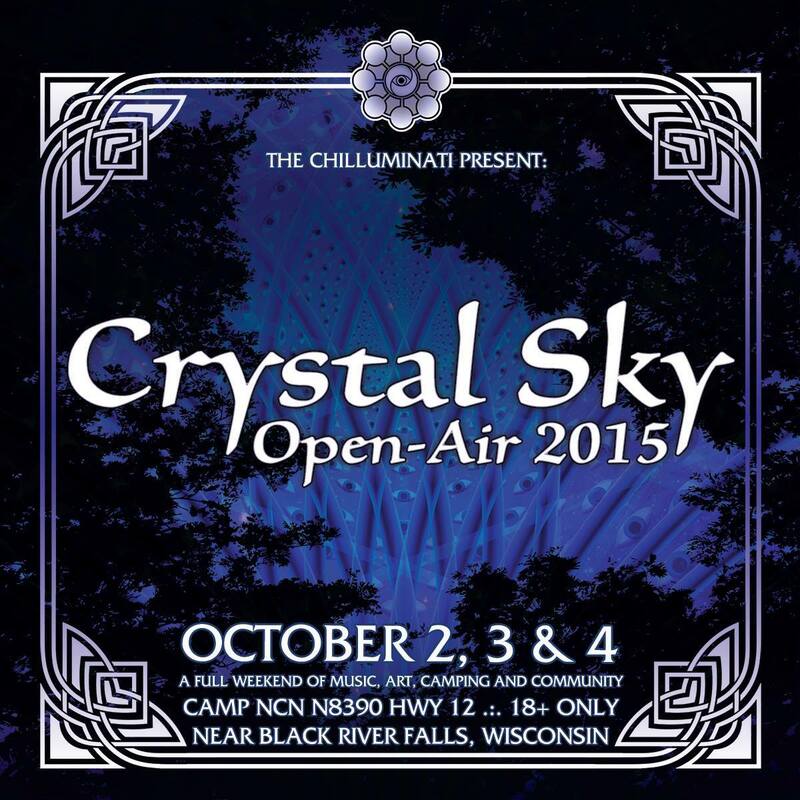 Crystal Sky Open-Air 2015 is an 18+ event, NO EXCEPTIONS. ID IS REQUIRED. We provide: 2 stages of sound, visuals, art, spiritual growth workshops, and amazing community. Warm indoor and outdoor amenities and many beautiful and secluded campsites for a relaxing and energizing gathering before the autumn chill sweeps in. Due to Wisconsin state regulations, all camp sites must be a minimum of 10′ (ten feet) apart. Join us as we bring the 2015 outdoor season to a close! Full artist lineup posted! * Click on any artist to see their bio! Ronin is Mike Redding. Originally from a sleepy little town in central Illinois, Mike grew a love for music from an early age by burying his ears deep into the local punk rock and metal scenes and was, for a long time, actually distinctly not a fan of electronic music, as he preferred moshing and head banging to dancing. Then one fateful night he had his soul violently comendeered by by the overwhelming power of psytrance. Before he knew it found himself squarely in the middle of the dance floor completely unable to control the urge to let it all go and just get down. He knew then and there that he had found his home. Ever since he has made it his personal mission to absorb all psychedelic musical delicacies that his mind, body, and soul could withstand, and as DJ, seeks only to share to this experience with others. His music will put you heart in your throat, your head in the clouds, and hurl your consciousness to the cosmic winds. JunJuar got into playing music not for the recognition or to play the most popular tracks, but to be a part of something more. To help create and share an experience with everyone, to be the catalyst and guide to an eclectic experience whether or not that was wanted. JunJuar, an unassuming creature, finds himself drawn to the more mysterious soundscapes. Since 2010 he has navigated the dance floor into the realms of the unimaginable. His sets can be described as being a journey though rare corners of the mind. AVAИT GAЯDE from Michigan promises to bring the next generation of hitech-harmonic-melodic-fast-psychedelic music to the US Midwest scene. With a wide collection specializing in the advanced guard Hitech contemporaries, (e.g. Furious, Kashyyyk, Will O Wisp, Glosolalia, Megalopsy, Sonik Scizzor, Insector, and more), you will be sure to hear tracks from your favorite hitech releases, as well as their unreleased gems. I haven't ever had a description here. I've been doing this whole DJ thing since October 2007, and started producing in the summer of 2012. Nothing spectacular in that area yet (practice makes perfect). My sets are constructed in a way to tell a story, there is meaning behind each mix, I hope each set can connect with you as deeply as it does to me. A lifelong love of music and a powerful draw towards community has led Sol to the psychodelic trance experience. Sol strives to bring an intensity to the dancefloor fitting of the dark and beautiful recesses of the night. What you will encounter is not just music but a bearing of his spirit, a longing to share his passion and take you on a journey you will not forget. New to Tai Chi? No worries? Come see what it's all about, all skill levels welcome! Bring some of your favorite crystals, and an open mind :-). We will discuss the "basics" of sacred and metaphysical properties of crystals in an open and imaginative setting! This workshop is based around the idea that all of existence is vibratory energy. This workshop is designed to take that simple principal and expand it into all areas of life bringing about a collected and connected perception of "all" and one's place in it. Come learn about the meditative, entertaining, exciting and relaxing effects of origami on your brain. This mysterious character lives in Chillicothe, Ill. quietly plotting intricate and intense electronic music while blithely being behind the mask of the ubiquitous suit and tie. Along with his personal recorded output (Sacred Earth 2012 is the latest on 1320 Records), Suit & Tie Guy also records other bands (Black Magic Johnson for one) and claims the position of â€œhead honcho and chief dishwasherâ€ for STG Soundlabs, â€œthe worldâ€™s only purveyor of exclusively Moog and Eurorack format analogue synthesizer modules.â€ Joining S&TG in this fascinating foray into contemporary electronica performed in a live setting are Cory Flanigan, a solo drummer/synthesizer player from Peoria and the Luzhin Defense, consisting of the Rogers brothers (Eric and Alexis) playing together to compliment Ericâ€™s original songs. This should prove to be a unique and experimental night of music and a rapid and distinct departure from your normal guitar bands. Get out and get it. Itâ€™s good. Future Sight is the combined forces of Kenny Sefton and Peter Kedzior from Chicago, IL. They are a DJ/Production duo that focuses on futuristic psychedelic trance. After a chance meeting they decided to bring their influences together and create a new sound. With a keen ear for high quality dance floor music and a background in music production, their sound combines pumping basslines with deep, atmospheric, progressive melodies and groovy, driving full-on. Their goal is to take you on a cosmic journey that moves your body and uplifts your mind! Truly a connoisseur of psychedelic electronic music and art, Blue Spectral Monkey has been evolving, collecting and spinning incessantly since 1995, taking him across 23 states and Canada. BSM has played over 600 DJ sets spanning many genres and styles. From IDM to minimal techno, dub to funky chillout, glitch hop to drum and bass, psytrance to ambient, you never know what you might hear in the seemingly infinite depths of his collection!He is well known for his skills as a downtempo/chillout DJ, and joined the Interchill Records team in 2006. He dives deeply into the groove, all the time keeping the sounds thick, groovy and trippy. Hehas shared the stage with many internationally renown artists including: Androcell, Solar Fields, Gus Till, Bluetech, Kilowatts, Aligning Minds, Jaia, Govinda, Third Ear Audio, Liquid Stranger, Tripswitch, Piltdown Sound, Outersect, Kalya Scintilla, Hypnagog, Mustard Tiger and others! Still fascinated by the mystery of psytrance, in its many forms, BSM explores this potent musical language with a sense of humor and curiosity. Focusing more on the techy chunky side of things after some years dabbling in deeper darker foresty sounds, you might also hear a rare set of suomi or daytime party grooves. BSM has played alongside many well known psytrance artists, for example: Lemurians, Onkel Dunkel, Psychoz, Loud, Onnomon, Ocelot, Mubali, Bodhisattva 13:20, Primordial Ooze, Shapestatic, Secret Society, Naked Tourist, Terrafractyl, and many more! Several years of music production has resulted in over 2 hours of original material, in a collaborative trance project known as Medimonkz, as well as newer material, spanning genres, made more recently alone. As one of the main organizers of TOUCH Samadhi he was responsible for the facilitation, decoration and promotion of countless dance events across the USA. In addition, he has organized the downtempo stage at the infamous Gemini Festival for two summers. The downtempo monthly at which he was a resident and organizer, Immersion, ran 10 months straight and is hibernating until a new, ideal location is discovered. Working with Metacrew in 2010, resulted in 4 outdoor events and a well received monthly, Psyche. Aligning Minds is the shared voice of electronic music producers Daniel Merrill and Michael Folk. As lifelong friends, music has always been their chosen path to express, explore and reflect the space within themselves as well as the world around them. With a soulful, melodic sound that fuses emotional atmosphere with deep sub-heavy grooves, they have carved out a multi-genre style that carries universal appeal. With releases and remixes on labels like Gravitas Recordings, Adapted Records, Aleph Zero, Beats & Pieces, and Muti Records, they move forward to capture a spirit of unity, diversity and vision. Their latest album, My Heart is Love has been called "An exquisite album of deep, soulful, chilled bass and euphoric frequency bending." (Igloo Magazine, 2013) and "a quest to express a heart so full you can hear the birth pangs of the new world borne forward." (Reality Sandwich, 2013). They are currently touring across the continent in support of My Heart is Love on a run of dates that stretch into Winter of 2013. Aligning Minds has had the pleasure of sharing collaboration and peformance/tour opportunities with artists such as Emancipator, ESKMO, Amon Tobin, Papadosio, Heyoka, Alvin Risk, Beats Antique, Invisible Allies, Robert Manos, Shpongle, Alex Grey, Kaminanda, Daedelus, Mochipet, Richie Hawtin, John Tejada, Nosaj Thing, Benga, edIT, Tipper, Jimmy Edgar, Vibesquad, Bluetech, Kilowatts, Untold, OTT, Juno Reactor, Random Rab, Milosh, and many more. Moving forward in 2013, they are focusing on an upcoming release schedule that will include a follow up "Remixes" album for My Heart Is Love along with a new EP, features on multiple compilations and several high profile remixes – while keeping up a steady stream of tour dates. Strooya is a DJ, musician, promoter, and producer with years of performing experience. He has performed live at countless music festivals, clubs, and private events across the Midwest and the US. He mixes a variety of music, focusing both on live recordings (reggae, funk, and disco) as well as electronically produced dance music (House, Techno, and Breakbeats). By going beyond radio hits and incorporating on-the-go sampling and looping, Strooya is sure to get those feet going.He hails from Rijeka, Croatia, and is an academic by day, but a DJ and drummer by night. Primordial Ooze / Kaiser Soze / s.o.t. Psychedelic trance, chill and ambient are the music that we play. Music in itself is a transformative and psychedelic agent. Our events are about transformation and becoming. You bring your own sense of spirituality. Our gathering is a gift which we all (organizers, artists, musicians, stagehands and attendees) give to each other.